A former New York Times executive editor has admitted the publisher of the media outlet drafted an apology letter to the Chinese regime after publishing an investigative report about corruption within the Chinese Communist Party’s (CCP’s) ruling elite. 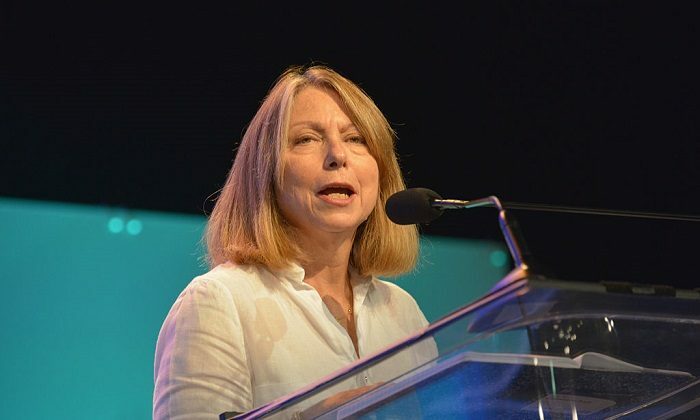 Jill Abramson, executive editor at the outlet from 2011 to 2014, wrote in her upcoming book “Merchants of Truth” that her “blood pressure rose” when she first came across a draft letter from publisher Arthur Sulzberger, according to Fast Company. She said the letter was written with “input from the Chinese embassy,” and sought to appease the regime in hopes the outlet’s business in the country could be salvaged. According to Abramson, Chinese officials were “enraged” after being contacted for comment about the piece, delving into the vast wealth amassed by family members of the CCP’s top leaders. The Chinese ambassador then sought a meeting with Sulzberger, in which he threatened there would be “serious consequences” if the story were published, Abramson said. No evidence was offered from the Chinese ambassador to dispute the claims. Despite the alleged threat, Sulzberger proceeded to publish the story, which later won a Pulitzer Prize. Within a few hours of publication, Chinese censors blocked both the outlet’s English and Chinese websites across Mainland China. NY Times China-bureau journalists were also denied new visas in the aftermath of the article. The websites remain blocked in China to this day. Sulzberger caught a flight to China to try to convince Chinese officials to unblock the site but was unsuccessful. The outlet had only recently opened its Chinese-language site, which employed 30 Chinese journalists. Abramson accuses the publisher of drafting a letter without her knowledge and with input from the Chinese embassy, “all but apologizing” for the story. The former editor said she later confronted Sulzberger about the letter at a Starbucks cafe. During the meeting, Sulzberger “seemed startled that I had [the letter] and he kept saying, ‘I didn’t do anything wrong.’ He tried to slip the letter into his folder but I snatched it back,” Abramson said. Sulzberger ultimately agreed to reword the letter with input from Abramson and then managing editor Dean Baquet, she said. Abramson was still opposed to the letter due to the way it apologized for the “perception” the story created. In a statement to Fast Company the NY Times disputed Abramson’s account, saying it was inaccurate. The statement did not provide further detail. Attempts to censor reporting critical of the Communist regime is one way the CCP seeks to influence overseas media landscapes, a campaign that has deepened and intensified in recent years, according to Freedom House. The regime’s media influence campaign is aimed at promoting a positive view of China, encouraging foreign investment in China, and marginalizing and suppressing dissenting voices, Freedom House senior research analyst Sarah Cook said in her 2017 testimony to the U.S.-China Economic and Security Review Commission. The communist regime uses a range of tactics to both promote its propaganda overseas and censor news that is unfavorable to the regime, Cook said. Elsewhere, the regime recruits journalists from South East Asia and Africa to report positively on infrastructure projects under China’s One Belt One Road initiative, a flagship foreign-policy project that has been increasingly scrutinized for burdening countries with crippling debt. Cook said censorship efforts range from direct action by the CCP to prevent publication of undesirable news stories, and cyber attacks on news outlets, to more subtle forms of influence, such as using economic incentives and disincentives to induce self-censorship by media owners. “The way in which these tactics function is by hindering and harming … the long term financial sustainability of media outlets … that [are] critical of Beijing,” Cook told The Mark Palmer Forum: China’s Global Challenge to Democratic Freedom, hosted by the Hudson Institute and Freedom House in Washington D.C. last October. “[The tactics] comprise a systematic effort to signal to … media owners that their operations in China and access to Chinese citizens will be jeopardized if they assist, do business with, or refrain from censoring voices the CCP has designated as politically undesirable,” Cook said.